Supplied as an established plant in a 2L pot to plant out all year - approx 20cm tall. 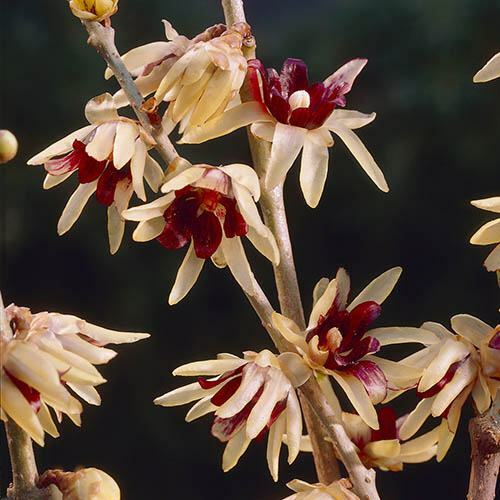 A super little scented winter treasure 'Wintersweet', as it is commonly called, produces stunning buttery yellow flowers in clusters, each with a lovely burgundy centre and veining detail. Producing a lovely sweet scent on bare stems, they are a joy to behold on cold winter days. An easy and fairly quick grower, it thrives in mixed shrubberies and borders, or larger pots, in sun or light shade, where you can bring them clsoe to the house for maximum fragrance enjoyment. They also make a lovely long-lasting cut stem for the vase also. Supplied as an establsihed plant in a 9cm pot, 15-20cm tall, ready to plant out all year. Dormant in Winter, so no leaves on then.